I know that by following up my last star-studded post with this one, I am going to look a little bit show-offy. Trust me, I don't have days like last Tuesday often. After my morning with the Disney folks, my kids and I had an invitation to attend the world premiere screening of Untamed Americas, a National Geographic miniseries airing for the first time this weekend. I have some thoughts about taking three quirky kids to a movie premiere in a minute, but first I want to tell you about this miniseries. When I was in high school, I took a wildlife biology class because I thought it would be awesome. It turned out to be taught by the wrestling coach and consisted entirely of his showing us nature documentaries, mostly Wild America with Marty Stouffer. Really, Marty Stouffer taught that class. The only homework we had was that the night before the test we had to write five multiple choice questions about the type of animal we had "learned" about. The teacher then chose from those questions to make the tests for the following year. Public education right there, folks. Anywho, I tell you that to let you know that (a) I've seen a lot of nature documentaries and (b) nature documentaries have come a long way over the course of the past 20 years. 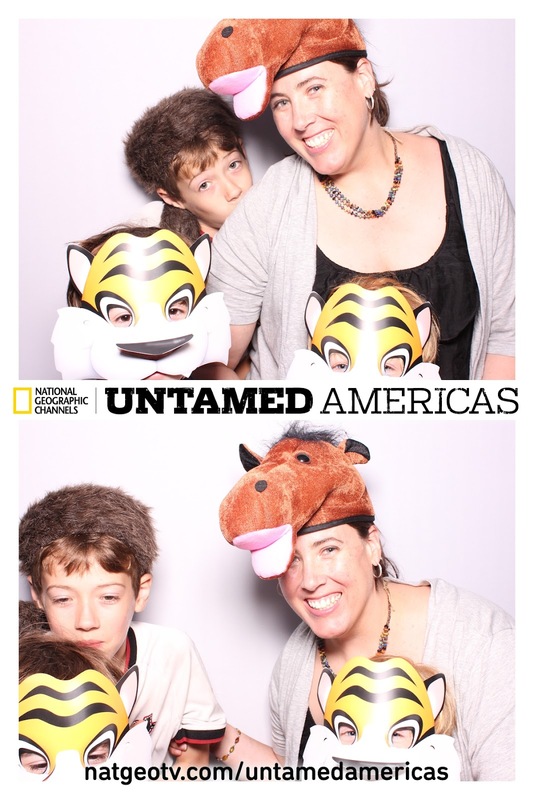 Untamed Americas—at least the part of it shown at the screening—is incredible. It features the kind of camera work that leaves you wondering how they got the footage at the same time that you don't really care, because, oh dear lord, did you see those bighorn sheep head butting each other? Josh Brolin narrates this super informative and gorgeous series that covers North America, Central America, and South America. The part we saw started with a wolf hunting caribou. It was incredible. There was even footage of a bat that has never been filmed for television before. There is this ONE flower and this ONE kind of bat is its only pollinator. Nature is kind of amazing. Sam was completely rapt during the whole screening. He especially loved one particular part that showed the stars as seen from one particular place in Latin America (I don't remember specifically where; I'm so sorry). See, he's been doing a project about astronomy and he's really into the stars. You should have seen that kid's eyes widen when he saw that scene. Which brings me to my kids. And taking them to a movie premiere. The screening was held at the Uptown Theater near the National Zoo. There was actually a reception at the zoo following the screening, so we parked at the zoo and walked down to the theater. I figured that would help my kids get some of their crazies out. It also let me stop at the zoo sign and take this picture, something I've been wanting to do for ages. It works on a lot of levels. When we arrived at the theater, there was a red carpet and lights and a lot of sort of hip, young DC-type people in their hip, young DC clothes and sporting their hip, young DC attitudes. We stuck out a little bit. At least they didn't knock that sign over. It looked for a moment as if they might. My kids were way into the free popcorn and set to ingesting vast quantities of it while we waited for the movie to start. We chose seats near the back, but there was a wide horizontal aisle right in front of us, which made us extremely visible to people walking up and down the regular aisle, in particular photographers, who were DE-lighted to find a family in attendance to photograph. Unfortunately, my kids were about as good at smiling for them as they are at smiling for me when I'm behind the camera. There was a lot of chatter and speechifying by some pretty fancy people prior to the screening, something I would have been very interested in under normal circumstances, but my circumstances at the time consisted of trying to keep Jack from bouncing and rocking entirely out of his seat. He was LOSING it. Normally, he's really good about movies, but the unfamiliarity and waiting of this event sent him into overdrive. Fortunately, soon enough the movie started and his attention was recaptured. Unfortunately, I soon discovered that I had chosen a seat right next to one of those annoying people who won't stop talking throughout the whole movie. Also unfortunately, it was Quinn. He had something to say about EVERYTHING he saw on that screen. He was fascinated, but he was loud. Jack continued to fidget. Sam only looked away from the screen long enough to snap his fingers at me to demand more popcorn. The filmmakers after the screening. We walked back to the zoo for a reception where it soon became clear that we were not fancy enough. I mean, no one gave us the stink eye or anything, but my kids are not the sort of people who eat crab cake canapes off of plates carried around by roving waiters. We are, however, the kind of people who put on funny hats and let people take our pictures. Some of Team Stimey was too short for the photo booth. Oh, and then some more photographers found us. We were even more exciting when half of us were wearing tiger masks. Jack and Quinn actually posed that time. We wandered around a little bit more, picked up some ice cream sandwiches, and then I noticed the table full of glasses at kid height and realized that it might be a good idea to bail. Sugar + glass + fancy people + Team Stimey = Just go. Go now. Anywho, we had a fun little evening, full of new experiences and my kids got their first movie premiere under their belts. As did I. 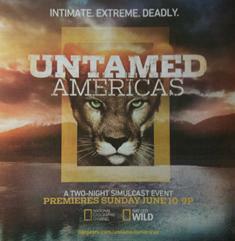 Our DVR is set to record all four hours of the Untamed Americas miniseries, which will be broadcast on the National Geographic Channel, NatGeo Wild, and NatGeo Mundo on June 10 and 11 (this coming Sunday and Monday) at 9pm ET/PT. It is rated TV-PG for animal violence—namely bloody evidence of the wild food chain, although none of my kids objected to that. I love watching nature documentaries and I am happy to be able to pss on this love to my children with quality programming such as Untamed Americas. Disclosure: We attended this event for free but were not asked to nor compensated for writing about it. My opinions are my own. My kids did consume copious amounts of free popcorn and ice cream sandwiches. That sounds like it was a fantastic time. : ) Movies are one of the things my daughter REALLY doesn't do well, so we have to wait until a movie is nearly out of theatres and go when it's empty. I'm only disappointed that Algernon didn't get to go too...he'd look awesome in one of those tiger hats. At first, I thought you were going to have a plot twist that designated Team Stimey as representative of Untamed America and that you were going to have your own reality show. Now that's television even I could get excited about! "Unfortunately, I soon discovered that I had chosen a seat right next to one of those annoying people who won't stop talking throughout the whole movie. Also unfortunately, it was Quinn." What a great experience! Team Stimey sounds quite a bit like my family...especially the consuming mass amounts of popcorn and deciding to leave when a table of glasses at kid-level beckons. We have this set to record, also, as my oldest is an animal junkie! Great experience! And congratulations - I think one of the most important parenting skills is knowing when to bail. I love the Stimey photobooth photo more than free popcorn. And would totally dig free popcorn. Love the Zoo sign photo. I never get that amount of cooperation for funny poses. Maybe I should try offering free popcorn. We also have a compulsive (loud) narrator in our midst. It's as if he forgets we're all watching the same film. I think you and I took the same HS class. Only mine was "Earth Science" and it was taught by the football asst. coach. I took it to avoid chemistry but didn't realize that apparently it really was for the varsity athletes! Can you picture the confusion when he asked what our 2 page papers would be about and everyone else said something like, "The Panther" or "Panda Bears" and I said, "The Environmental effects of NAFTA"?? -- NERD. Also loved the line, "Unfortunately, it was Quinn"
Cute and funny I totally have to do that picture at the Zoo. What day was this we were there Sunday morning. 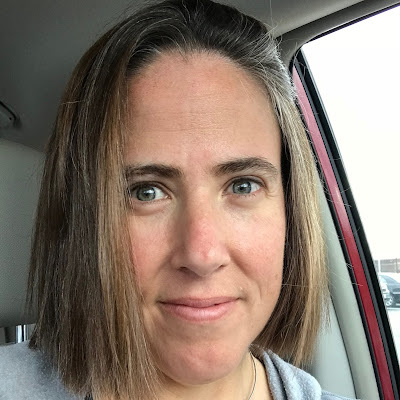 I have been to enough of these blogging things to get how things work, and I usually basically know what to expect. Unfortunately, I forget that my kids don't. I recently took Tate (age 5) to a McDonald's event and felt totally embarrassed that he wouldn't pose/smile nicely for any of the photographs and acted weird during the behind-the-counters tour. You just hope people remember that it was promised to be a 'family-friendly" event, right? Yeah, I know how lucky we are that my kids are so good about movies. They weren't always. It's cool. I liked the wolf a lot. He ran with his tongue hanging out. You know, that's true. It's something I didn't get the hang of until recently. I used to hang in longer, for no discernible reason. God knows why. I tried to get them all to sit nicely in their letters and smile. So they didn't really cooperate. But I think this photo does a really good job of showing their personalities. I like it better than if they had sat and smiled. Tuesday evening. And you should get that zoo photo. So much fun! Totally. I figure if people read my blog they know what to expect, right? The Uptown theater is great, though recently they seem to screen the major commercial movies. So, I prefer the Avalon and the Landmark. [Just btw, the Avalon also has premieres; however they don't always tell you the name of the movie beforehand, and therefore you can't take the kids. I attended 'Monsieur Lazhar' this year. *Excellent* film, though quite sad at times. ]As you likely know, the Avalon also offers occasional family weekend matinees. I *can* recommend those.Finally, while I almost never watch nature documentaries, there was an excellent one in the past year about lions. However, the movie is very sad overall - it's basically a fight between lions, gazelles, zebra, hyenas, and bison / buffaloes. And almost no one survives. Forget I mentioned it, if only for the kids' sake. The scenery is beautiful though! Movies are sketchy for us. Sometimes, the forces are all with us and we can all sit through a movie and enjoy it. Sometimes, not so much. Learning when to bail has been a slow skill for me. Sounds like you've gotten the hang of it though. The reference to hip young DC people? Hysterical. I have some as in-laws and they are a different species. So energetic and confident! So well groomed and so determined to make the most of every opportunity! Fankly they make me very uneasy. You get to go to a lot of fun stuff. Maybe I should move closer to you and I can go as your date.